I have been pushing this back and forth for some time now – writing articles in magazines is great and earns some money and reputation but the downside is the “global reach” – especially when you are writing for a German magazine. The other downside is the limitation in size – a magazine article typically ranges anywhere between four to eight pages, if there is more about it, it often is split across two issues. Which is what has happened to my article on Jagdgeschwader 3 on the Eastern Front in 1941. Published in the German Jet & Prop Magazine, it was split into two and it still was short one some details and photos. There is only one solution to both, “global reach” and content size: one needs to take publishing into his own hands. The platform? A global player – amazon. The format? A Kindle eBook. The price? Less than two issues of a magazine that would take the article in print – and free if you are a Kindle Unlimited reader. Follow the story of Hans Papenhagen, a Gefreiter with Jagdgeschwader 3, as the fighter wing moves from the French Coast to the vast steppes of Russia. 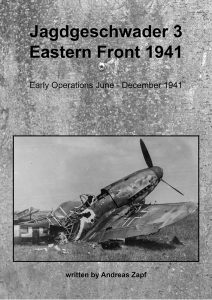 Based upon entries of his original diary, the story of the famous fighter wing unfolds as the men around Kommodore Günther Lützow move into Russia as part of “Operation Barbarossa”. Their initial push into the Soviet Union takes them to the Battles of Kiev and Uman, then north to support “Operation Typhoon”, the Battle of Moscow. This entry was posted in Spotlight Series and tagged JG 3. Bookmark the permalink.